When i lived in Celio, at the Lay Centre at Foyer Unitas, this was one of my favorite quirky little places. Marian shrines cover the city at nearly every corner, often small and easy to miss. This one is said to mark the spot of the legendary Pope Joan’s labor. I came across this other bloggers pictures and account of the story, and it seemed worth sharing, just for a little something fun! I live close to this little shrine and I love that people always leave flowers here. In summer, winter, rain or shine… and a couple of times, even in snow! 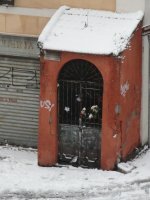 … people come to this little portico to leave their floral offerings. My children like to pass by and count how many flowers have been left on that particular day for Papessa Giovanna – or Pope Joan. 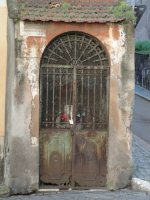 For that’s the over-one-thousand-year-old legend that keeps the offerings coming to this little spot in Rome’s Celio neighbourhood. And how can you not love a city that keeps its medieval legends alive and well in our modern world? By A.J. Boyd in Uncategorized on December 2, 2014 .